ANNOUNCING OUR 2019 SUMMER YOGA RETREAT!! Join Lee Ann Louis-Prescott and the Yoga Center for Healthy Living for this completely customized and unique Yoga Retreat experience! Rejuvenate your body, mind, and spirit with 7 days and 6 nights of yoga, meditation, culture, excursions, and beauty in Southern Iceland! Lee Ann will be teaching twice daily yoga practices that feature an eclectic blend of Hatha, Vinyasa, Yin, Partner, and other styles. These classes are expertly designed to help balance your body, mind, and soul. Join us on this journey; discover what makes Iceland a one-of-a-kind country and deepen your practice during this transformative yoga retreat! Note: For our 2019 yoga retreat, we have the amazing opportunity to partner with True Nature Travels who will aid in all logistics and coordinating of our retreat plans. During your Southern Iceland retreat, you will visit two different parts of the country: Reykjavik and Laugarvatn. Reykjavik is the capital city of Iceland and one of the most popular destinations in the country. Laugarvatn is a southern Icelandic destination that embodies the beauty of Iceland’s countryside. In Reykjavik, you will stay in a modern Icelandic hotel with chic, spacious group rooms. Spend your days in Reykjavik wandering the quaint European streets, touring museums that highlight Iceland’s incredible art scene and complicated history, and shopping for all your Icelandic souvenirs! Who do I contact with questions or to discuss the retreat in more detail? We have a wonderful opportunity to work with True Nature Travels on this retreat experience. They offer a wonderful customer service program for our participants! Prema Easter (info@truenaturetravels.com) is our lovely student liaison for any students signing up for the retreat or considering signing up. You will book airfare to the Keflavík International Airport (KEF). Before booking tickets, please be sure you have received your official confirmation note that the retreat has met its minimums. There will be one group airport shuttle each way based on our flight window guidelines. Be sure your flights align with the provided flight windows if you wish to use the group shuttle. We cannot emphasize more the importance of travel insurance. As we all know, especially as travelers, “life happens.” Whether it’s family, work, mother nature, or a change of heart, it is important to be prepared in case you need to unexpectedly change your travel plans. Often for less than $100, you can purchase a travel insurance policy and be protected in the event that you need to make a change or need to be covered financially prior to or during your trip. To purchase insurance with the True Nature discount, click here. Join us in beautiful Irish Hills (near Brooklyn, Michigan) for a weekend of yoga, healing, and much more! The retreat begins at 5:00 pm on Friday, November 1st and goes until 12:00 pm on Sunday, November 3rd. Approximately 1.5 hour drive from Yoga Center in Brighton. A gift package...and MUCH MORE! $395 if paid by July 31st, 2019 or $445 if paid after July 31st, 2019. *$100 non-refundable deposit reserves your space. Extra fee for single occupancy room. The Sivananda Ashram is located across the bay from Nassau, Bahamas on one of the finest beaches in the Caribbean. It is truly an island paradise and a sanctuary of peace and natural beauty. We hope you will join us for these 5 days and 4 nights of practice, rest, and rejuvenation. Your Yoga Retreat Center for the week is CastelBrando, located in the heart of the Prosecco hills, between Venice and the Dolomites, and between two of the most beautiful towns in Italy, CastelBrando is one of the most refined examples of redevelopment of the Italian historical and artistic heritage and one of the largest castles in Europe. 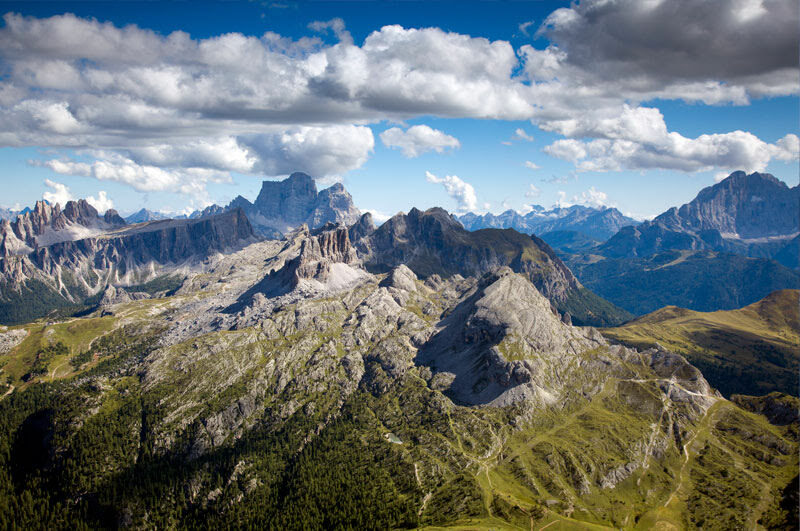 The roots of CastelBrando date back 2000 years and represent an open page on the history of this territory and people. 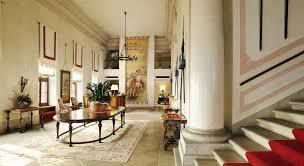 Over the centuries, the castle went through a series of extensions and in 1997 was completely restored. CastelBrando: A grand medieval castle in Cison di Valmarino, Italy. All rooms feature a spectacular view, A/C, a minibar, free WI-FI access, TV and a safe. CastelBrando features two restaurants and wine cellars on site. Junior Suites: furnished in Venetian style and embellished with ancient stuccos and Venetian flooring. Each has a lounge area and some have a fireplace. View of the valley and hills. Note: CastelBrando is a national historical monument and therefore, rooms are not all equal in size. 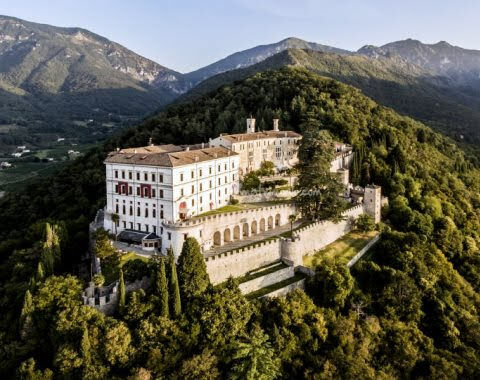 CastelBrando Spa: The spa and wellness center features a swimming pool, whirlpool, Turkish bath housed in Roman structure, finish saunas, Kneipp path, fitness room and sunbathing terraces. Beauty treatments and massages are available at additional cost. Spa Menu. Contact Alessia Moro at Rising Vacations. alessia@risingvacations.com or simone@risingvacations.com or info@risingvacations.com. Direct line: 1 619.202.9442. Final payment is due April 15th 2020. A non-refundable deposit of 30% is required to hold your space. In the case that the spot can be filled by another student, a refund is granted less a $150 cancellation fee. Note: Optional, Day 4 excursion is non-refundable once confirmed and paid. Rising Vacations will once again be our fearless leaders during our European yoga retreat. Contact Alessia Moro at alessia@risingvacations.com or simone@risingvacations.com or info@risingvacations.com. Direct line: 1 619.202.9442. 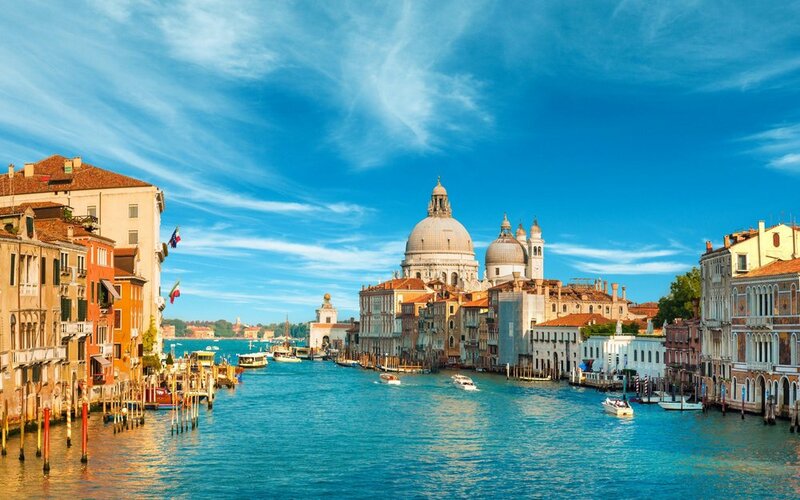 You will book airfare to the Venice Marco Polo Airport in Italy (VCE). Before booking tickets, please confirm the flight window time given the group transfers, otherwise you must obtain your own transportation. Please let Alessia know in advance so that accommodations can be made. What is the Optional Day 4 Excursion? 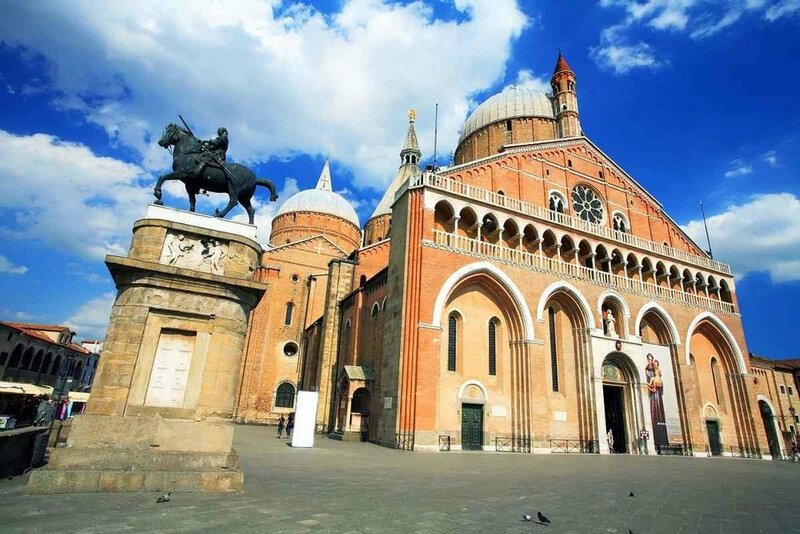 Enjoy a walking tour of Padua and its major points of interest including; Prato della Valle, Basilica del Santo, historic center with University, Caffe Pedrocchi and Palazzo della Ragione. Duration is 3 hours. Cost is $170 USD. Minimum of 15 participants. View our Photo Galleries of past retreats!